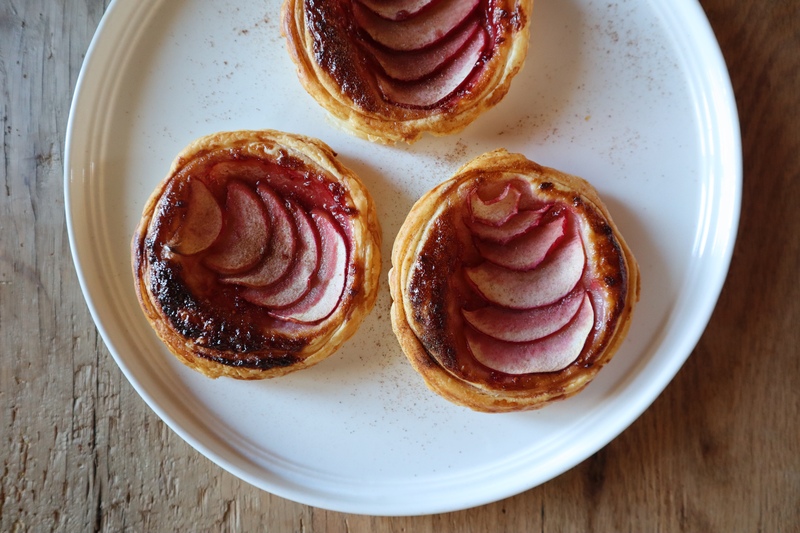 The combination of sweet juicy apples, raspberry jam, cinnamon and flaky pastry make these ‘simple to cook’ tarts a hit with young and old (and everyone in-between!). Pre-heat oven to 180 degrees Celsius. Cut out three round discs from puff pastry sheet and place on a sheet of baking paper on oven tray. Gently scour a border on pastry about 1 cm from the edge. Equally divide raspberry jam and spoon on to each tart, spreading out to the border edge. Top with finely sliced red apple. Sprinkle with cinnamon. Brush pastry edges with milk and bake in oven until the pastry is puffed and golden (about 10-15 minutes). Serve on own or topped with Greek yoghurt, double cream or ice-cream. Enjoy! ELE tip – these delicious pastries are delicious both hot or cold, making them an easy lunchbox treat.